Wisconsin Gov. Scott Walker will be one of 10 Republican presidential hopefuls to grace the Fox News stage on Thursday for the prime-time GOP debate. Fox and the Republican National Committee decided to use national polling data to split the Republican field into two groups. Walker's group represents the leaders in the polls, while the other group features those who aren't doing as well. But many are wondering whether Walker will be able to hold his own against Donald Trump, who is often louder and more assertive than Walker in his campaign speeches. Regardless, there are few issues Walker is sure to hammer, even if Trump rants about immigration. 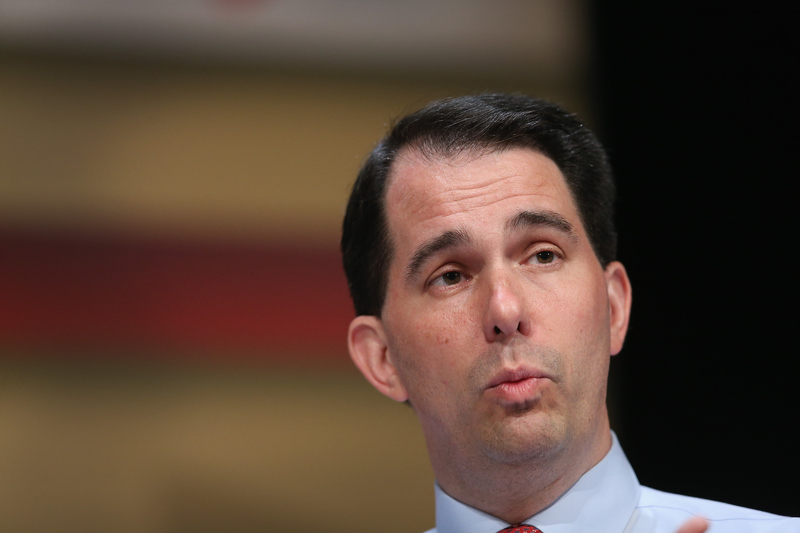 You can expect to at least hear quotes about these things from Walker during the GOP debate. Walker is well-known for comparing union protesters to Islamic terrorists and for his restrictive policies on women's reproductive health and access to abortion. Walker has said that he will avoid engaging with with Trump or any of the other candidates during the debate — rather, he plans on saying what he's "for," according to CNN. Walker also said he isn't prepping for the debate at all. He's just going to relax and visit the Wisconsin State Fair on Thursday morning. So will that make him extra fiery during the debate, or lazy and unprepared? I guess we'll find out on Thursday, but here are a few things you can already expect him to harp on. This is important because our goal is peace, but there will be times when America must fight. And if we must, Americans fight to win. This is Walker's claim to fame, so he will probably play it up during the GOP debate. Walker stripped many public-sector unions in Wisconsin of their collective bargaining rights, which allow employees to negotiate working conditions with their employers en masse. Walker has famously said that collective bargaining isn't a rights issue, but is rather an "expensive entitlement." Mother Jones showed how the U.N.'s Universal Declaration of Human Rights and the National Labor Relations Act both state that the ability to join unions and participate in collective bargaining is a right, but Walker has stood firm on the issue throughout his campaign. Though Walker has touted the fact that he's saved money for local governments by reducing spending on pensions and health benefits for public employees, many critics have pointed out that he's simply shifted those costs onto the employees themselves — forcing them to pay more for benefits, according to Talking Points Memo. Walker's points about unions during the debate will probably include him talking more about fighting for taxpayers and not "nibbling" around the edges of a good union fight. But some have argued that comparing himself to Reagan could set Walker up for problems when it comes to his lack of foreign policy experience. Sen. Marco Rubio, a fellow 2016 GOP candidate, said "there is no way” that a governor can be ready “on Day One to manage U.S. foreign policy," according to Newsweek. And Walker actually responded with “I think he’s questioning how Ronald Reagan was ready.” Sigh. I want a commander-in-chief who will do everything in their power to ensure that the threat from radical Islamic terrorists does not wash up on American soil. We will have someone who leads and ultimately we’ll send a message that not only will we protect American soil, but do not, do not take this upon freedom-loving people anywhere else in the world. We need a leader with that kind of confidence. If I can take on 100,000 protesters, I can do the same across the world. Let's hope he repeats that last quote.